Your stone is a natural gemstone. Your stone is a one of a kind and nothing can replace it. 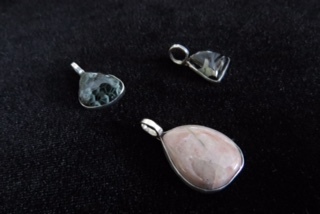 The best way to clean your gemstone is with warm water and a cotton cloth only. For best results, use the warmest water you can stand to handle safely. If you are still having difficulty cleaning the silver, we recommend that you warm apple cider vinegar to the warmest you can safely handle and accurately clean the silver portions of your jewelry, while trying to avoid your gemstone. Your stone should be kept free from perspiration, hairspray, cosmetics, lotion, dust and dirt when possible. It is best to wipe your stone off after use with a soft piece of warm, damp cloth to remove body oils or dirt after use. Hand-wash your stone periodically with mild soap. Use a soft brush to clean away dirt if necessary. After washing or brushing, rinse in clean water and wrap in a thin, damp cotton towel to dry off. It is not recommended to use harsh cleaners, detergents, soaps, shampoos, jewelry cloths or jewelry liquids, chemicals, detergents, chlorine, or other artificial cleaners. Do not use Ultrasonic cleaners or tarnish creams. Avoid swimming in pools, hot tubs, and the ocean with your gemstone. Silver is the most reflective metal on Earth that takes a brilliant white metallic luster. Silver will tarnish when exposed to air, water, and sunlight. 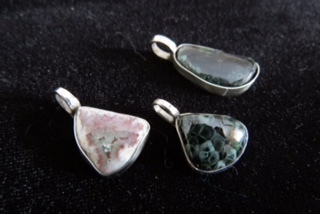 When you are not wearing your gemstone, store in a dry place away from sunlight.